The convenient-to-use Mass Box contains everything a priest needs to celebrate Mass—a full set of vestments, altar linens, pyx, and sacred vessels. These Mass Boxes, which may be purchased from Apostolic Work for 350 euro, are then given to priests on the missions who pray daily during Mass for the donors and their loved ones. The Chalice and Ciborium will have the names of your loved ones (living or deceased) inscribed on them. 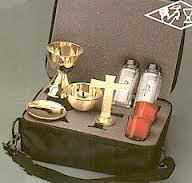 The neat Mass Box itself can be used as an altar if required e.g. missionary priests serving in bush country. All the fabric contents of the box are all made by our active members in their respective sacristies or homes. Here in St Anthony’s Clontarf we use the Sacristy on Thursday afternoons between 2-4 pm. Every year Orders of Nuns and Priests request from us all these items which we give without charge, as this is funded by our secret bag monthly and our church gate collections yearly from various churches around Dublin. Despite the serious recruitment problems in the Dublin Diocese where we have thirteen other branches, our Apostolic Work continues to meet, in large measure, all of the many and varied calls made upon it. We have sent Mass kits to Africa, Peru, Ethiopia, Ghana, Kenya, Nigeria, Tanzania, Zambia, Zimbabwe, Uganda, India. Within Ireland we have branches in most Dioceses. There are only six active members in St. Anthony’s Clontarf – we are ‘crying out’ for more volunteers. We sew all that is needed, using a sewing machine, but some people crochet cinctures, others make rosaries, and some hand-sew altar linens. Enquiries to Mary O’Reilly at (01) 833 8556 / 086 889 1236 or any member of Apostolic Work. The Apostolic Work Annual Report for 2013 can be found here.